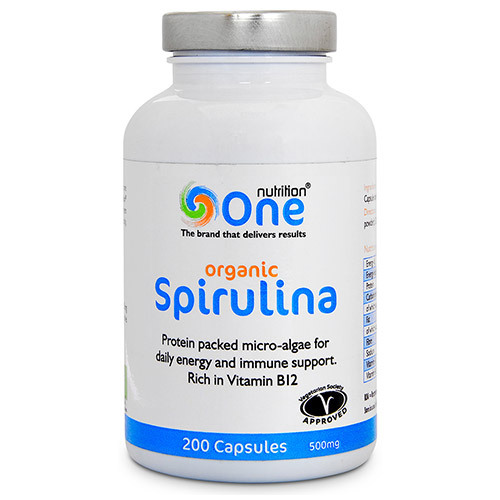 One Nutrition Organic Spirulina is a protein packed micro-algae for daily energy and immune support, which is rich in Vitamin B12 and bursting with green goodness. Unlike many green foods, One Nutrition Spirulina is easily absorbed by the body, ensuring you get the full benefits from all its nutrients. Maintenance 3-6 capsules daily (1.5-3g powder); optimal 7-12 capsules daily (3.5-6g powder). 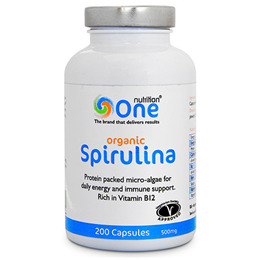 Below are reviews of One Nutrition Organic Spirulina - 200 x 500mg Capsules - Best before date is 17th May 2019 by bodykind customers. If you have tried this product we'd love to hear what you think so please leave a review. I love this product. Started using it about a month ago and already I can feel my energy greatly increased from what it had been prior to starting. I will definitely be buying this product again.